Did you enjoyed the Mayan Apocalypse? This time are the vikings to condemn us. 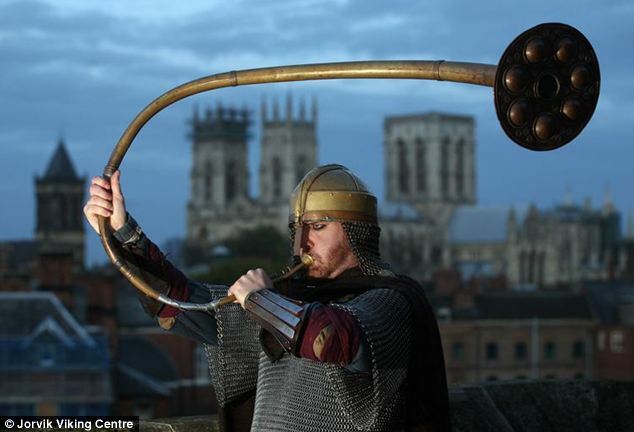 If Vikings were here today, the sounding of a distinctive horn in York would have created chaos. The ancient instrument, blown last night, signalled exactly 100 days until the end of the world, according to Norse mythology. Legend has it that the Norse God, Heimdallr, would blow the mythical Gjallerhorn to warn of the Viking apocalypse, also known as ‘Ragnarok’. Ragnarok, which translates to ‘Doom of the Gods’, is due to be preceded by the winter of winters. Vikings believed, prior to the apocalypse, three freezing winters would follow each other with no summers in between. All morality would disappear and fights would break out all over the world, signalling the beginning of the end. The wolf Skoll would devour the sun, and his brother Hati would eat the moon, causing stars to vanish from the sky and the Earth to be thrown into eternal darkness. Norse mythology experts have calculated that Vikings believed this will take place on February 22, 2014. On this day, the god Odin will be killed by the wolf Fenrir and the other ‘creator’ gods. There will be huge earthquakes, the sea will rear up and the soil and the sky will be stained with poison. The sound of the horn is supposed to call the sons of Odin to the battlefield, where Odin will ultimately be killed. After his death, the Earth was foretold to sink into the sea, paving the way for a new utopian world with endless supplies. Danielle Daglan from the Norvik Viking Centre told MailOnline that a number of recent events spoken about in the legends of Ragnarok led them to believe that the end of the world may well be imminent. ‘The idea that “boundaries that exist shall crumble” could be said to be about the Internet age, where you can communicate with millions of people simultaneously around the world thanks to the global rise of social media,’ said Ms Daglan. Viking tradition also believes that a vast winter will appear before the apocalypse. ‘There are predictions that we are heading into a mini-ice age thanks to a fall in solar flare activity – what is a mini-ice age but several winters rolled into one?’ said Ms Daglan. Another part of the legend claims that the Midgard Serpent, named Jormungand, shall free itself from its tail and rise up from the ocean. Ms Dagland points to the two huge fish which appeared on a beach in California last month. 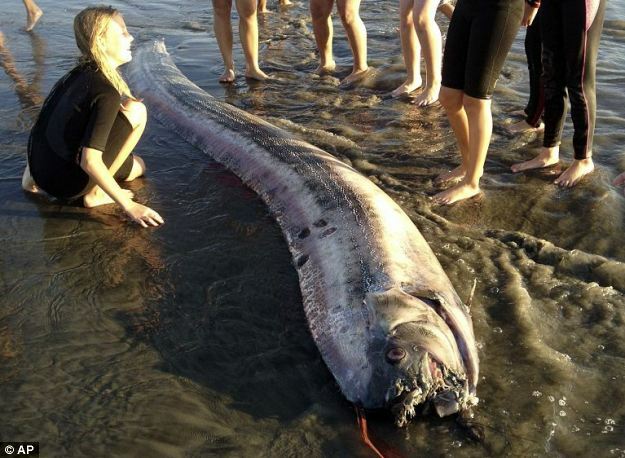 The giant oarfish were dead when they washed up on land, and some scientists believe they came ashore to die because they are ‘in distress’. ‘Traditionally, the Viking festival of Jolablot marked the end of the winter – if this winter truly does not end, then that feast may be given over to Ragnarok instead,’ said Ms Dagland. The Jorvik Viking Centre predicted that Ragnarok would occur on 22 February because this is the end of the feast of Jolablot. While not a scientific conclusion, they claim that Vikings loved to feast and wouldn’t want to miss this event. For this reason, they argue that Vikings would believe the world would end in 100 days. The end of the world is coincidently the start of the grand finale of the Viking festival in York. ‘Following a study published in 2010 that bearded men are more trustworthy than those without, we’re also looking for fantastic displays of facial hair, so that we can identify those with the potential to take us into the brave new world that is foretold to follow Ragnarok,’ said Danielle Daglan director of the JORVIK Viking Festival. ‘In the last couple of years, we’ve had predictions of the Mayan apocalypse, which passed without incident, and numerous other dates where the end of the world has been pencilled in by seers, fortune tellers and visionaries,’ she added. WHY DOES THE JORVIK VIKING CENTRE BELIEVE RAGNAROK IS IMMINENT? Another part of the legend suggests that the Midgard Serpent, named Jormungand, shall free itself from its tail and rise up from the ocean. This entry was posted in Uncategorized and tagged 22 February 2014, apocalypse, viking, Viking apocalypse. Bookmark the permalink.